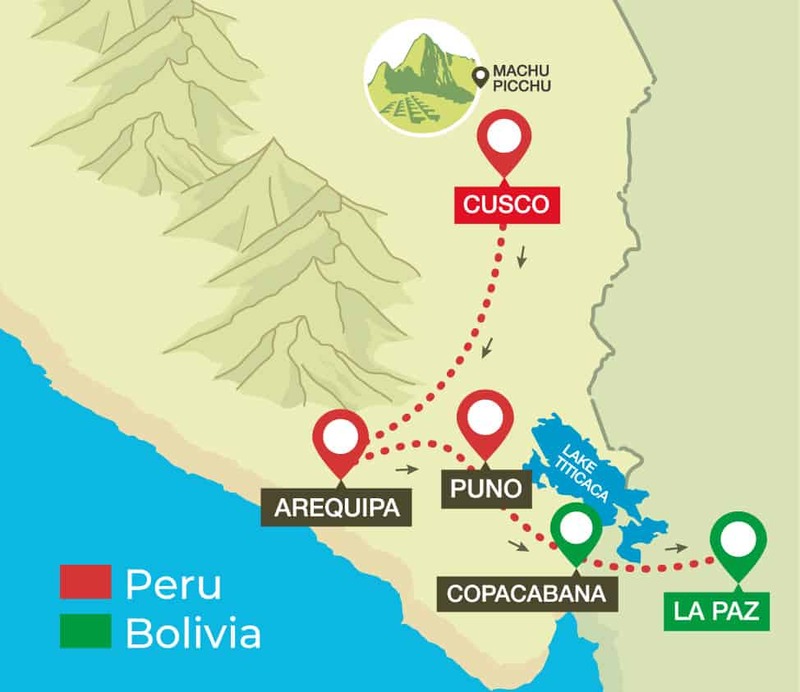 Only a few hours away from Cusco is our first stop, Arequipa. Journey from the amazing and cultural City famously known as the gateway to Machu Picchu, to the equally as stunning destination known as ‘The White City’. Arequipa is probably Peru’s most beautiful city. It is surrounded by 3 volcanos and is known as ‘The White City’ because many of it’s buildings are constructed from sillar, a white volcanic stone. We highly recommend taking time to explore this incredible place. Extra Colca Canyon Tour Info: Colca Canyon 2 day tour begins at 08:00am (can be done on the same day as arrival). Departure From: Peru Hop Private terminal just 10/15 minutes from hotels (address will be provided on booking confirmation). Lake Titicaca Tour: See how locals build and live on the floating islands of Lake Titicaca, the highest navigable lake in the world. Any hostel/hotel in central Puno (within 1km of Plaza de Armas). Isla del Sol: According to Inca legend this small island in the middle of Lake Titicaca was home to their most revered god, Inti, and was the mythical birthplace of the first Inca ancestors. A 4 hour round trip in our private boat takes you out to see the ancestral terracing and ruins of the southern part of the island as well as the existing island communities (includes a 1 hour walk from the original sun temple to the small island town of Yumani). Includes island entrance fee. Copacabana is a small village. Central drop-off/pick-up point used in Copacabana due to its small size and limited access. Meeting point is the White Anchor by the port, within a few minutes walk of all major hotels/hostels. Death Road: One of Bolivia’s biggest attractions, this activity is not for the faint hearted. Death Road is perfect for any adrenaline-loving travellers and is among the most challenging activities you can do in South America. AREQUIPA PICK UPS: Between 05:15 and 05:45am. Be ready at reception at 05:15am. MAIN ACTIVITY IN PUNO: Lake Titicaca Tours. 2 Hour, Full Day or Homestays Tours (1 night) are available at Lake Titicaca. MAIN ACTIVITY IN COPACABANA: Isla del Sol boat trip (4hr round trip). Departs 14:00pm from the White Anchor. Returns in time for the bus to La Paz the same day. Or stay on the island and return the next day. DEPARTURE POINT FROM COPACABANA: WHITE ANCHOR – Please don’t be late or you will miss this bus! PLEASE NOTE: There will be no buses from La Paz - Copacabana and Copacabana - La Paz on Saturday 15th June.